A thread came up on the LPG Forum recently about tools required for LPG installations. So I thought it might be useful to some of you if I opened up my tool box and let you have a peek. I'll break things down into sections. Lest you get disheartened at the array of tools in the photos, with only one or two exceptions I didn't buy these just for LPG work — in fact I'm not sure if I’ve bought any tool just for that — and you certainly don't need them all. In several places I've linked to external websites, this should not be taken as an endorsement of individual products, merely as a means of assisting you in identifying what I'm talking about. First and foremost, you need to be competent and confident about working on vehicles. You will be working on bodywork, engine, fuel system, cooling system, and electrics — if there's any of that you aren't comfortable with then you either need to stop or get assistance. Next you'll need to be familiar with the UKLPG (formerly LPGA) Code of Practice No 11 Autogas Installations No 11 Autogas Installations. I couldn't possibly comment on whether there might be a copy findable via an internet search engine. You will need sufficient information about the vehicle in order to find all the electrical circuits you'll need to connect into, the right coolant pipes to tap into, and so on. You will also need the instructions for the LPG equipment — this normally comes with the kit but not always as some manufacturers assume it's going to be fitted by someone that has been on their course and/or has their technical manuals. Well, it goes without saying that you'll need various workshop power and hand tools — spanners, drills, files, etc. To a certain extent, there is a tradeoff since (for example) a lack of a welder simply means you'll have to use ingenuity to avoid the need to weld brackets together. A vehicle lift (2 or 4 post), or at least a pit, is very useful for some of the work. If fitting tanks underneath, then a vehicle lift and transmission lift is highly recommended — I can tell you from experience that lying on your back while trying to manoeuvre a heavy gas tank (or set of tanks) into place can be hard work. You will have to cut a hole for the filler, or make a bracket if mounting it on the tow-bar for example. 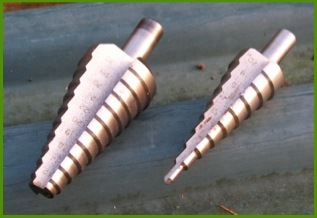 The filler points require a sizeable hole, and a ‘Q-max’ cutter that size isn't cheap. Alternatives include stitch drilling and filing, or careful work with nibblers. 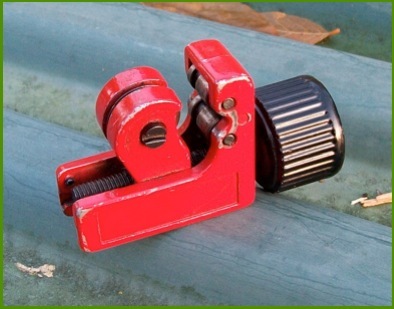 I have seen a nibbler that goes in a drill (such as this one from Sealey)and can nibble freeform, but I've never used one. You need a means of mounting the tank — this can be as simple as drilling two holes for a spare wheel well mounted tank, or at the other extreme fabricating a frame requiring the ability to cut steel sections, possibly bend them, and weld them together. Similarly, you may need to make brackets for vapourisers, injector units, electronics modules, etc. At it's simplest this may mean bending some flat strip and drilling holes, or it may involve welding some bits together. Some of the holes you need to drill can be fairly large and in thin material, and I've found stepped drills are very good for this — though I had to take the tip off one to be able to mount a lambda probe boss without drilling through the other side of the exhaust pipe. You'll need some tools for working with 6mm and 8mm copper pipe, plus various sizes of plastic/rubber pipe. For cutting copper pipe I recommend a small wheel type cutter (as shown at top of page) — it's quick and mess free. You can use a fine hacksaw, but then you need to clean up the pipe end and clear the cuttings from the pipe so they don't block anything. For plastic and rubber pipes you can buy a cutter (similar to gardening secateurs) such as these from Laser Tools, but for the limited amount I do I've managed with a sharp knife (and the nouse to keep my fingers out of the danger zone). A pair of hose clamps such as these from Laser Tools can be useful to minimise coolant loss while you are tapping into the pipes. Joints in the high pressure side of the gas system usually fall into two types — flared fittings and compression fittings. Flared pipe ends are commonly found on 4 hole tanks, and require you to form a flare on the 6mm copper pipe. I've only had to do this once (on my Disco) and took the pipe down to the local garage who had a professional tool. You can buy inexpensive flaring kits such as this one from Sealey which should do the job as long as you are careful to get it straight. TIP – don't forget to put the nut on the pipe before making the flare unless those around you enjoy colourful language ! Compression fittings are usually 11mm or 13mm nuts, so you just need 11mm and 13mm spanners. 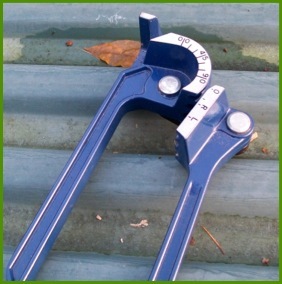 Since I have them already, I generally use pipe spanners when they'll fit as there's less risk of distorting the nut — these are Sykes Pickavant brake pipe spanners and indispensable for those stubborn brake pipe fittings. Rubber pipes for low pressure gas, and water, can be fixed with worm drive clips (commonly called Jubilee clips, though that's a trade name of one specific brand) or ‘squeezy ear’ pinch clips. Worm drive clips are best done with a flexible driver with hex socket on the end, or they can be done with a screwdriver. The ‘squeezy ear’ type are just nipped up with side cutters or pincers — they look neater but are harder to remove so make sure you get things right before tightening. Seasoned practitioners will just bend the pipes to shape by hand, mine usually end up more like a thruppeny bit than a circle — so I use a set of pipe benders. Mind you, using these can sometimes be like a one armed paper hanger — the first time I used them was when making a brake pipe, holding the old pipe as a pattern, the new pipe, and needing two hands for the bender ! 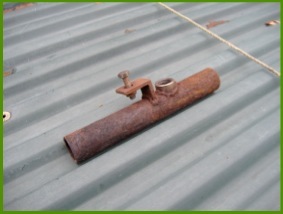 The quickest method to fix pipes is with P-clips and self drilling screws. I'd suggest getting them with hexagon heads, and these need a 5/16" (or metric equivalent) socket. My first tool was an old hex-socket bolt with the threaded bit cut off — it finally wore out after doing a good few thousand screws while sheeting a hangar. I now have a tool made for the job which is a lot better as it has a magnet to hold the screw in place while you get the hole started – I wish I'd bought one in the first place. And lastly, don't forget a can of leak detector. Many kits will come with a packet of terminals, fuse holders, etc. Even so, you may need others (such as ring terminals for earths and battery connections) and these should be of the uninsulated variety. Terminals should be crimped onto the wires, and so you'll need a crimping tool although for small quantities you can ‘make do’ with some small pliers. NOTE – I do not advocate using anything but a good tool for crimping terminals where it will be the only means of connection (the cheap flat plier type sold for insulated terminals don't count in my book). For the LPG system, all connections should be soldered, so having crimped the terminal, you'll need a soldering iron and solder. Let the terminal cool after soldering before crimping the strain relief onto the sheath. You'll need a selection of grommets where cables pass through panels etc, and cable ties to fix everything into place. If you really want it to look like it's supposed to be there then cable sleeving and/or loom wrapping tape are needed — loom tape is like electrical insulation tape but without the sticky side, it gives a more flexible loom than using sticky electrical tape. First of all you'll want a general purpose multimeter — this is useful for all sorts of jobs like checking for shorts before putting the power on, through to checking for voltages when commissioning or troubleshooting the system. As I mentioned in my earlier article on tuning, you may want some form of exhaust gas analyser — though this only really applies to open loop systems. This can be as simple as a lambda probe in a piece of pipe (like this adapter I made), or it can be a much more expensive analyser setup. For all but the most basic systems, you will need a computer. Ideally this should be a portable (i.e. laptop), and in many cases it needs to be an old one with a real serial port. It appears that while some software will work with some USB to serial adapters, this isn't always the case. And of course, you will need the software that goes with the LPG system you are working with.